One of my favorite memories is from years ago when I lived in a different house. 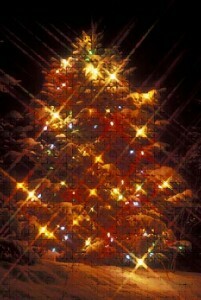 The next door neighbor hung numerous multi-colored outside lights on an evergreen tree in her backyard. 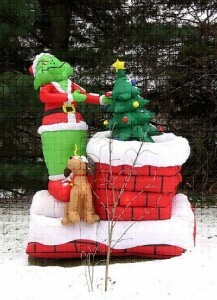 She left these lit all day and night and they were the only outside lights throughout all our neighbors’ backyards. I can clearly remember the first night I awoke in the middle of the night and looked outside. There was a fresh blanket of snow covering and the outside lights on the Christmas tree were sparkling with magnificence. It took my breath away. I found myself purposely getting up in the middle of the night, each night, to look at the festive winter wonderland of outside lights. When we moved into our next home, we copied this tradition of our old neighbor by hanging outside lights on our backyard evergreens to spread the luminescent luxury to others. I find myself grateful to have a family member who has the most beautiful patio I have ever seen. From the family room, you step out on the same level through French doors onto a cement patio with a large outdoor area rug. Directly across the patio is a working outdoor fireplace. When not in use, candles are strategically placed inside contributing to the patio lights. The outdoor room has a lighted ceiling fan, also contributing to the patio lights. Other patio lights include wall sconces, a floor lamp and assorted solar candles. Sofas are strategically arranged to allow for easy conversation and allow for easy viewing of the backyard. Landscape lighting makes the backyard glow with beauty. A privacy curtain, tied back during the day, is a creative way to enjoy private evenings outside. It’s easy to decorate this room for the holidays. 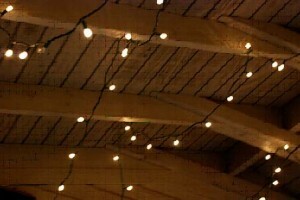 Monochromatic white Christmas string lights, hung around the room, add beautifully to the other patio lights.